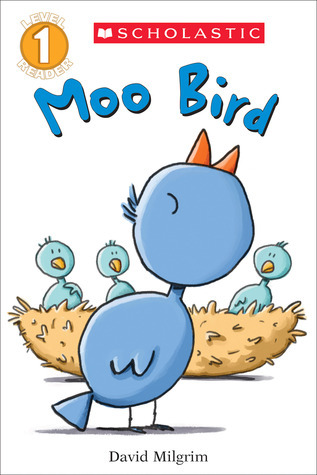 Summary: Four birds wake up in their nest; there are three “tweets”…and a “moo”! The moo bird is pushed out of the nest with the suggestion that he go find some cows. Off he goes, crossing paths with a pig, a horse, and a sheep, all of whom send him on his way. Even finding a cow proves disappointing, as she just thinks he’s confused. He starts to head back to the nest, wings drooping and black cloud over his head, when he finds another moo-er. It looks like the beginning of a beautiful friendship. 32 pages; ages 4-6. Pros: With comic style illustrations and just a few words per page, this is a sure winner for those at the earliest stages of reading. Cons: I am so busy painting my new house that Moo Bird is about the longest book I have time to read.